I mentioned before here that I fear Saturday morning very much because hubby works half day and I will have to take care of the two rascals at home by myself. It's not easy bathing both, feeding both, entertain both, playing with both, putting both to bed - all at different times. And oh, different place (for sleeping) too. 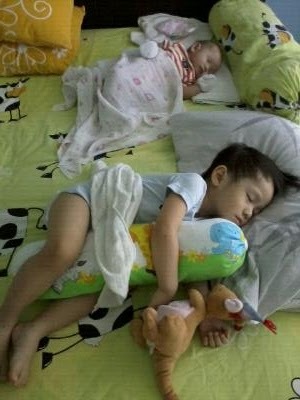 Kenzie sleeps in the master bedroom with the aircond on, whereas baby Gavin sleeps in the other room. But at night, Kenzie sleeps with hubby in the other room, and baby Gavin sleeps with me in the master bedroom. Sounds confusing? Forget it. Haha. Anyway, last Saturday I tried putting them together when they were asleep, so that I could enjoy the aircond (and perhaps, nap a little), instead of keep checking on baby Gavin in the other room while napping with Kenzie, but to my dismay, it only worked for less than half an hour. Baby Gavin made a lot of noises, stretching and all, so I had to put him back in the other room as I was afraid Kenzie will wake up. 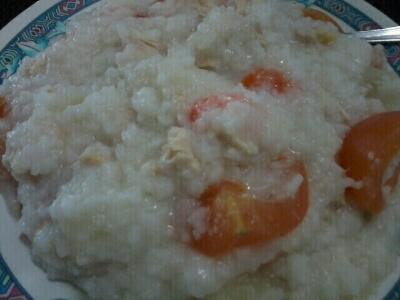 I woke up at 7am and boiled chicken porridge with carrots, potatoes and tomatoes for Kenzie. Of course I finished off the entire bowl after he ate a few spoons. He woke up at about 7.45am, baby Gavin already woke up at 7am by the way. I bathed Kenzie first, and then bathed baby Gavin. Became a play-maid and house-maid to both the whole morning, did some housework and all. Around 12pm, I prepared both to sleep. Kenzie was having constipation, so I put him on the potty. I could not remember how many times I had to put him on the potty that day. 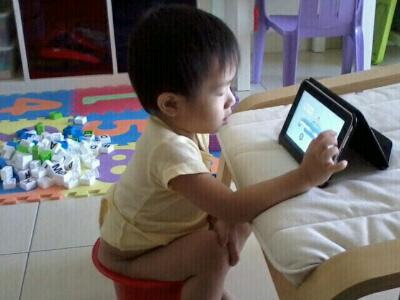 When he makes his "poo gesture" (mmh mmh sound), I put him in the potty. That's how we usually do if he wants to poo. And he would usually poo in the potty. But that day, his poo could not come out, I could not tolerate anymore after so many times putting him on the potty, so I used the pump - Ravin Enema. I was reluctant to use it, to be honest, but I was getting tired, frustrated and exhausted wearing his diaper, taking it off, putting him in the potty, waiting, and repeat all over again for God-knows-how-many-times! So after I used the pump, he pooed, and slept. Phew. Peace at last. Hubby came home around 1pm after work, tapau-ed chicken rice and we ate. Kenzie woke up at 3pm and skipped lunch because we would be going to the in law's and would normally have early dinner there, around 5pm. Came home around 7pm, I bathed baby Gavin, hubby bathed Kenzie. And that was my Saturday, gone in a blink of an eye.